The standing room only April 1 Council Meeting included several votes regarding Valdese Lakeside Park – and they all passed unanimously. One vote was to approve the Master Park Plan. When the approved plan is submitted with the PARTF grant, more points are awarded, which will put the application higher in the ranking to receive money. Approving the plan does not mean it will all be built, but will serve as a guide for developing Valdese Lakeside Park and show grant officials a plan is in place. The PARTF grant application will request funds for restrooms, picnic area, dog park, wildlife viewing platform, kayak launch, walking trail to viewing platform, parking, entry road for around $285K and the match will be covered by private donors and another grant. 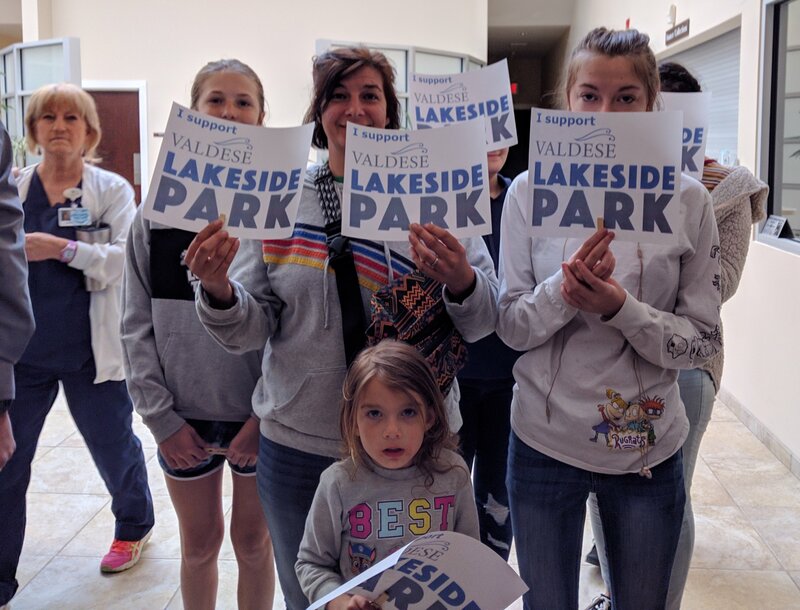 Thanks to the approximately 50 Valdese Lakeside Park supporters who attended the Council Meeting to make sure our voices were heard. With the council voting unanimously on all park related matters — we were successful in our efforts! Thanks to everyone who contacted a council person, attended, spoke, prayed and continues to believe. Speakers: Kristina Mercer, Jim Clark, Beth Heile, Christel Malloy family, Peter Skelton of The Levee, Linda Gibbs, Don Brittain, Dorothy Nurminen. Supporters Attending: Above plus The Farrar Family (4), Pat Zimmerman, Barry Zimmerman, Reba Page, Lisa and Scott Miller, Eric and Zakk Heile, Debbie Montanez, Kate Carter and baby, Maryann Diamond, Cutie Kaplan, Alicia and Ashton Mears, Amy Alexander and son, Tonya Stephens, Cheryl McCarthy, Joyce Brittain, James Sweezy, Spence and Jayne Borden, Barbara and Richard Little, Tim Horldt, 8 from the Christel Malloy family, Nancy Thomas, Jeff Zimmer, Andrew Atkin. Let me know who I missed. Kristina Miller Mercer spoke about how people are renting vacation homes in Burke County to enjoy our natural resources and how Valdese Lakeside Park will be a draw. And that the completed greenway will support wheelchairs, strollers, walkers and be accesible for many. Jim Clark spoke about how his active family (including Amy Alexander) used to drive to Hickory, Lenior and Morganton for outdoor recreational activities – until Valdese Lakeside Park opened. He also sees the park as an investment for our youth as they use the park for fun and are already acting as stewards of the land. Peter Skelton of The Levee Brewery and Pub spoke in favor of Valdese Lakeside Park and the business it would bring to town. Oh, and he is also in support of Food Trucks!! Donald Brittain talked about “suds falls” and how it will take time to complete the park- as did the Morganton Greenway – but would also bring a lot to Valdese. Also – Join FVR Today! Dorothy Nurminen spoke about how Valdese Lakeside Park would bring visitors from all around. She is from Granite Falls and brought her daughter to the park when she visited from CA. Linda Gibbs supported Valdese Lakeside Park by talking about how great it was to have a great outdoor resource available in Valdese. Christel Malloy family spoke about parks being the future for children to be able play outside all day! Beth Heile spoke about events happening at the park, donations raised and the need to vote yes for the Master Plan to respect the Valdese park donors who want their contributions to be increased with matching grants.